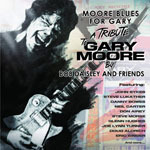 Share the post "Album review: BOB DAISLEY AND FRIENDS – Moore Blues For Gary – A Tribute to Gary Moore"
The main thing to glean from this album is that no-one did it quite like Gary Moore. He left us way ahead of his time in February 2011 after a long and sometimes under-rated journey first with Skid Row and Thin Lizzy, then with Colosseum II and finally with a successful solo career. This really took off at the instigation of long-time bass cohort Bob Daisley when it was suggested that Gary “played the blues” and there followed a series of albums starting with Still Got The Blues in 1990. At the time it was at the forefront of a blues-rock revival. In truth for the next ten years many fans longed for Gary to return to the more straight ahead rock of the Lizzy era and his early solo albums but it never really happened. He was sort of stuck in a blues rock vortex perhaps not of his own making. Especially after the album Trouble In Paradise in 1997 and the “experimental” A Different Beat. Bob Daisley (also known for his work with Ozzy and Rainbow) has now brought together a posse of fellow journeymen to create a long overdue doffing of the cap to the much-missed guitarist. This album focuses on the blues but also slips in two crossover pieces in the shape of (a mostly slowed down) ‘Don’t Believe A Word’ (featuring Damon Johnson) and the evergreen ‘Parisienne Walkways’ (with Steve Morse). Moore’s children Jack and Gus also contribute one song , ‘This One’s For You’, whilst Joe Lynn Turner pops up on two tracks including ‘The Blues Just Got Sadder’ with Steve Lukather. Whilst we should welcome such a tribute I’m not so sure that any of these tracks add anything to the story. Bob Daisley points out that this isn’t a work of re-creation but surely a really valid tribute album should find a subtle twist to the original rather than, in most cases here, a carbon copy. Perhaps the orchestral Gary, or Gary with female vocals and a big band? For example ‘The Loner’ is a great instrumental, and in Doug Aldrich’s hands we get a very passable version, but it’s same old, same old. And whilst it’s great to welcome back John Sykes no amount of vibrato can match the original of ‘Still Got The Blues (For You)’. Danny Bowes (Thunder) provides vocals. The album does underline what we already know. Moore had a romantic streak with songs like ‘Empty Rooms’ (sung by one-time sideman Neil Carter) and ‘Nothing’s The Same’ (expertly sung as ever by Glenn Hughes). This entry was posted in ALBUM REVIEWS, ALBUM REVIEWS (Mobile), All Posts and tagged A Tribute to Gary Moore, album, blues, blues rock, Bob Daisley, Bob Daisley And Friends, Doug Aldrich, Joe Lynn Turner, Moore Blues For Gary, review, Steve Lukather, Steve Morse. Bookmark the permalink.